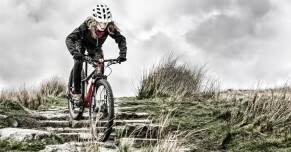 Boardman’s junior MTB fills the gap between cheaper bikes which are styled like mountain bikes but really aren’t very suitable for proper off-road use, and much more expensive MTBs like Whyte Bikes 401 and Islabikes Creig 26. 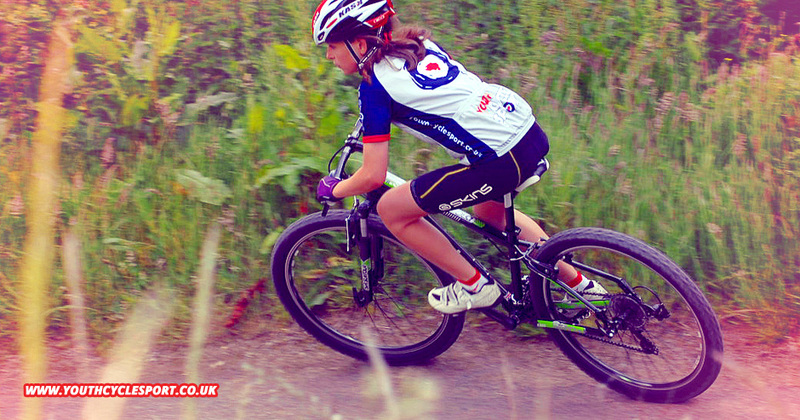 Some children aged 9 to 12 (the typical age range that the SPORT/e MTB will fit, depending on your particular child) will ride a 13”/14” frame extra-small sized adult model from big brands like Giant or Specialized. Those are often great bikes but they aren’t proportionally-sized for children, and crucially they usually have cranks that are too long. 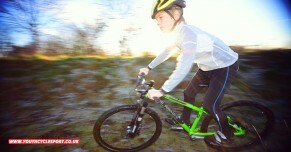 So, as a £300 MTB specifically designed for children, the Boardman has an opportunity to carve its own niche here. You can watch our video of it in action. 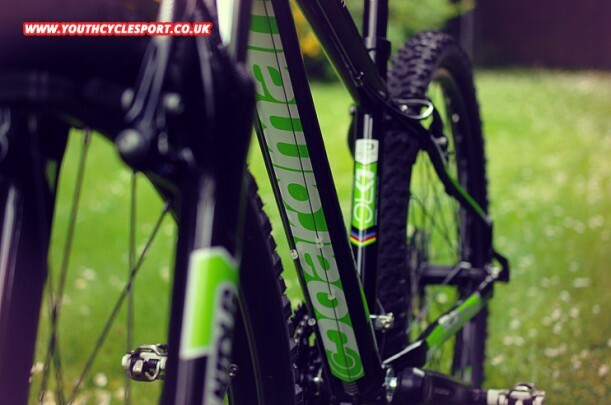 Like Boardman’s junior hybrid, the MTB’s frame is designed with a very steeply sloping top tube which gives a nice low standover height for short legs and allows the rider to manouvre the bike easily on tricky terrain and obstacles. 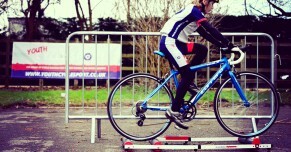 The frame is short enough to bring the bars close enough to a small rider. The bike needs to accommodate suspension forks and it also has a fairly long head tube for such a small bike, so the handlebars are positioned a little higher than we would like. 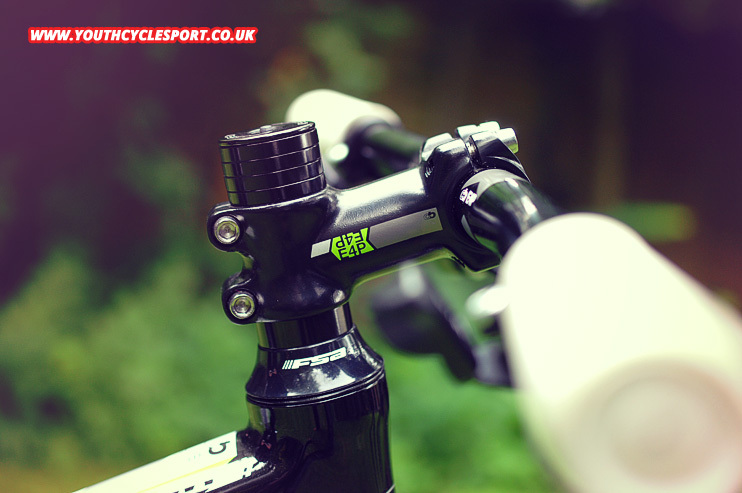 Smallest riders will probably want to flip the stem and place it beneath all of the spacers to move the bars as low as possible. 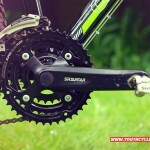 Crank length is one of the most important aspects of proportional bike design for children, and the Boardman’s 160mm cranks are correct for a bike this size. 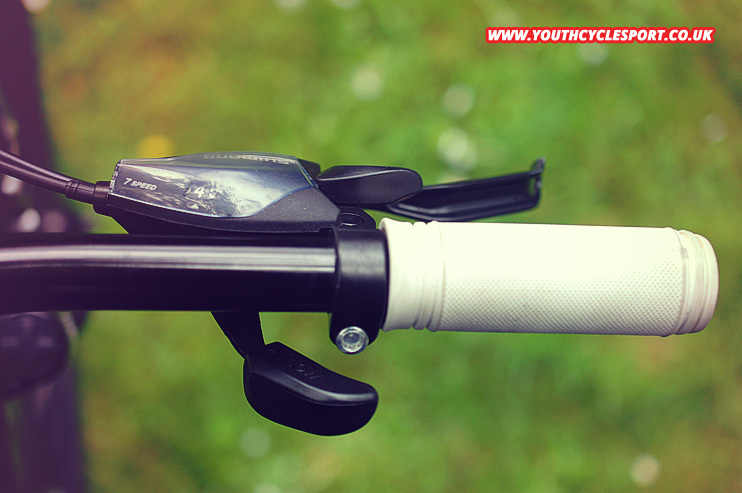 The MTB’s 540mm-wide flat handlebars and its 60mm stem are in proportion with the rest of the bike and its typical rider too, and so is its junior saddle. 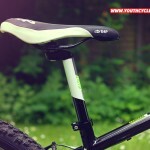 The SPORT/e MTB weighs 13.5 kg (29.7 lbs) without pedals. 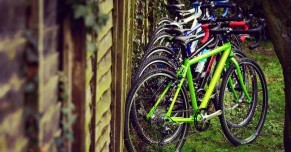 That’s not unusual for an inexpensive MTB, but it’s 2 kg more than a lightweight specialist MTB like the Islabikes Creig 26. 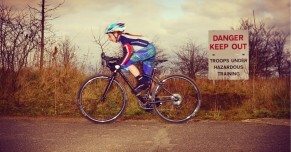 A small rider typically weighing 30 to 35 kg will certainly notice that extra weight when climbing or when accelerating the bike out of a slow speed corner. However, when you consider that losing those 2 kg would cost another £400, the weight penalty suddenly seems far less significant! 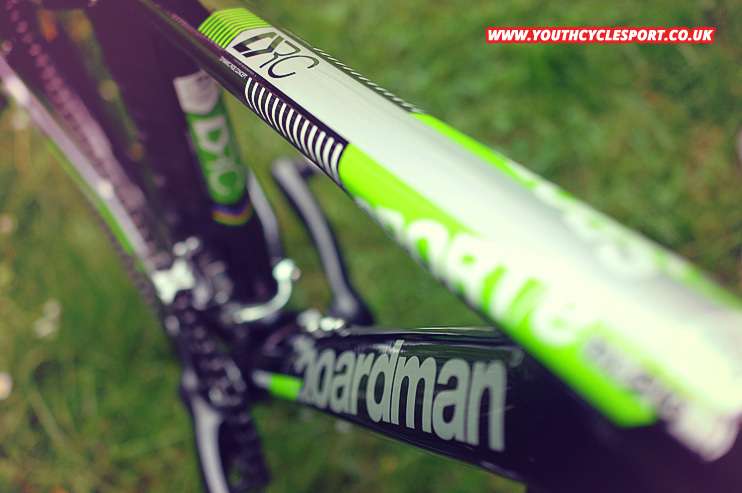 The MTB’s glossy black aluminium frame shows off the trademark Boardman smooth welds beautifully. 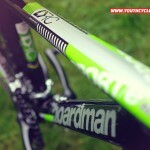 And with its bright green and white contrasts it looks just like Boardman’s adult Team 650b MTB frame – very smart! 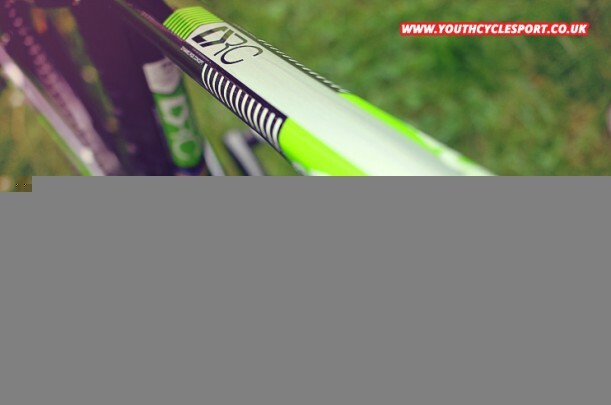 The junior bike’s frame design mirrors the adult Boardman hardtail models too, with the same shaping of the individual tubes and the beefy junction of the head tube/seat tube/top tube. 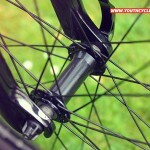 We noticed that there are braze-ons for a rear disc brake to be fitted if ever required too. 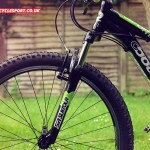 It’s difficult for manufacturers to fit an effective suspension fork to a mountain bike costing less than £500. Forks costing less than £200 tend to use a coil spring, and that’s what the Boardman uses. 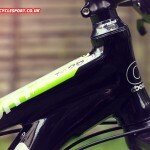 Such forks don’t have the adjustability or damping control of more expensive air suspension forks. Cheaper coil forks can be heavy too, weighing up to 2kg. 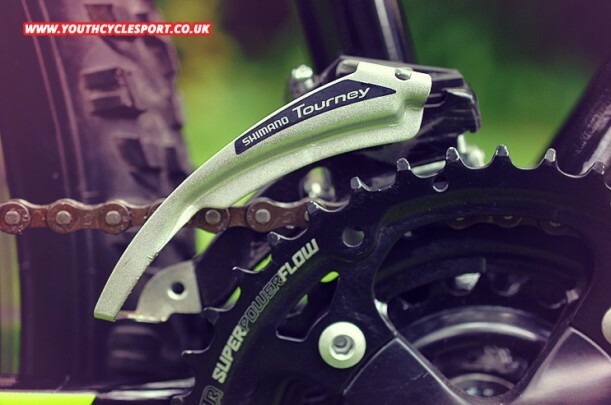 It’s even more of a difficult area for children’s bikes, as the rider’s bodyweight will be less than half of an adult’s – a fork designed for an adult will be far less effective for a child and it will feel much too stiff. 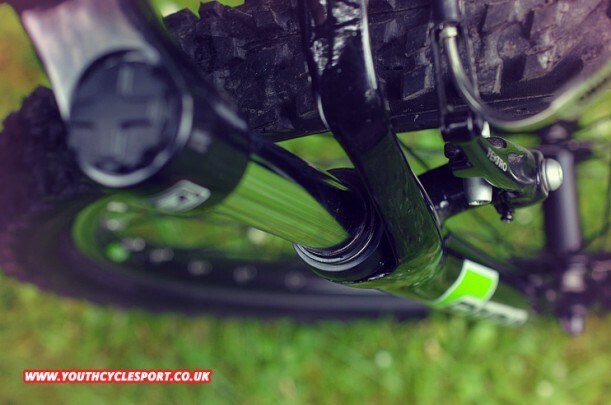 Our young test riders were familiar with the feel of well-adjusted air-sprung forks and, in comparison, they didn’t sense the SPORT/e MTB’s SR SunTour 3020 fork with 63mm travel was very effective for them. They felt that the fork was too stiff. 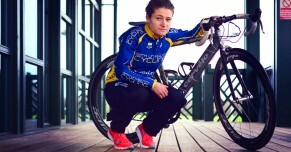 You have to remember that the whole bike costs just £300 though. 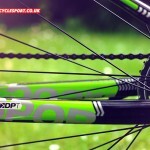 Having tested Boardman’s new junior hybrid and road bike we were already familiar with the MTB’s Boardman-branded E4P double wall rims and its quick-release hubs. 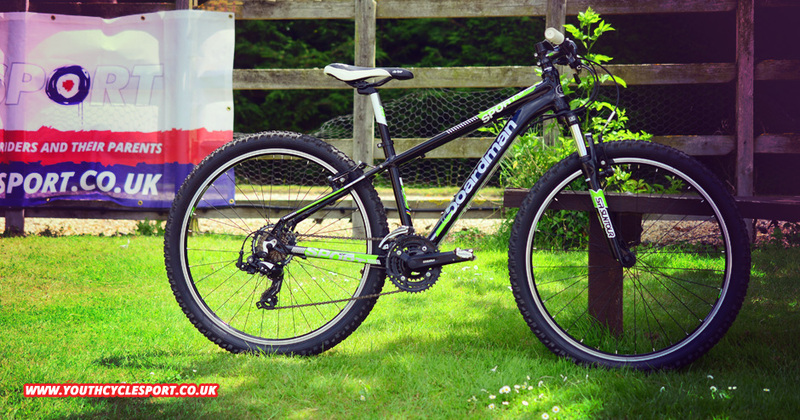 The wheels were well-built and they withstood some heavy off-road use without any distortion. 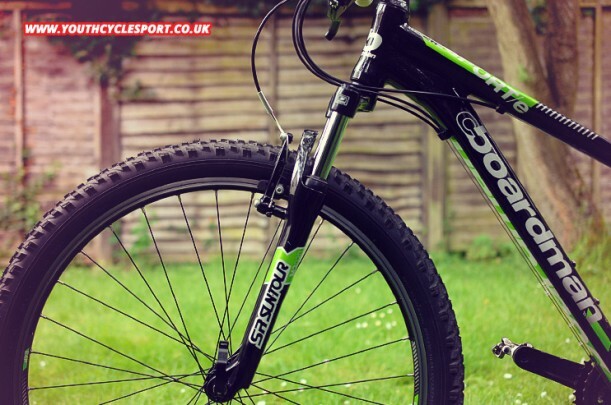 The tyres aren’t particularly light nor supple but, even with Boardman’s buying power, you’re not going to find high-quality MTB tyres worth £60 a pair on a bike at this level. 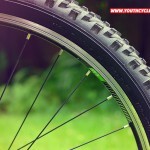 Fitting better tyres when funds allow would be a worthwhile upgrade though. 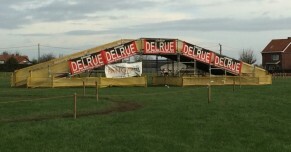 The standard tyres do have a good grippy tread though which had no problems in mud during our testing. 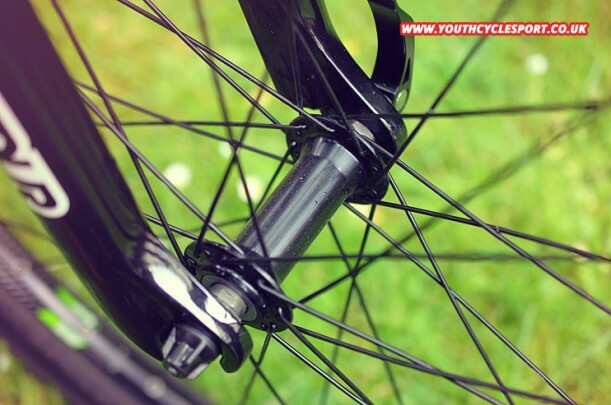 If you’ve already seen our reviews of the two other new Boardman junior bikes, you’ll know that they both have a rear hub with a thread for a screw-on 7-speed freewheel rather than being a freehub (i.e. 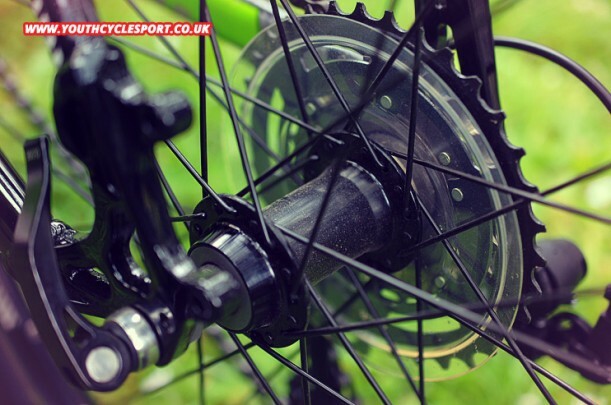 where the freewheel mechanism is integrated into the hub itself, and the sprockets are mounted on to it in the form of a cassette). 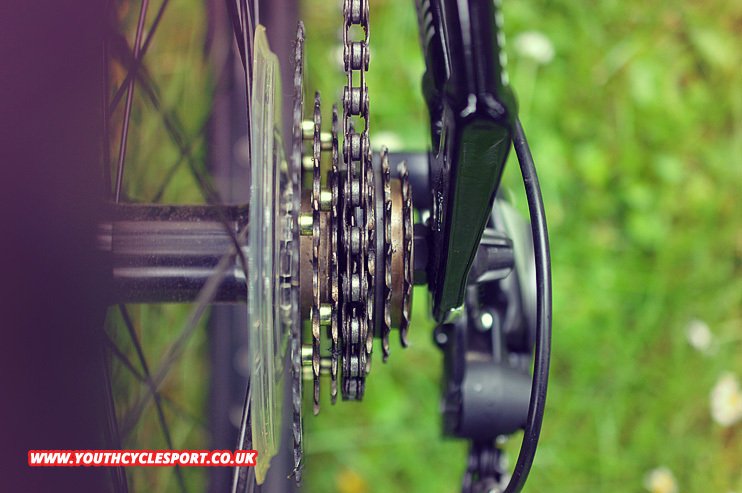 The SPORT/e MTB shares the same specification, and we’d like a 8-speed freehub & cassette here instead. 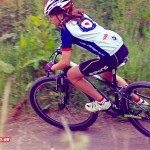 Boardman’s junior MTB does have a 34 tooth biggest sprocket though, which gives a suitably low gear ratio for off-road climbs. 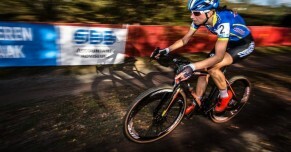 In the last few years Boardman’s adult MTBs have moved from a triple chainset to a double chainset which has advantages of weight, simplicity, and usability. 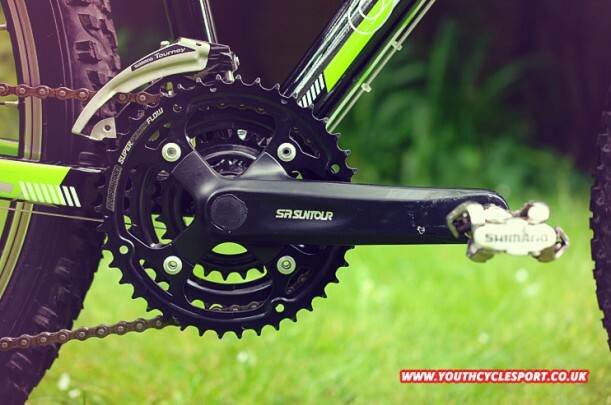 So we were quite surprised that the new junior MTB has three chainrings, especially as children often find gear choice difficult when riding off-road. 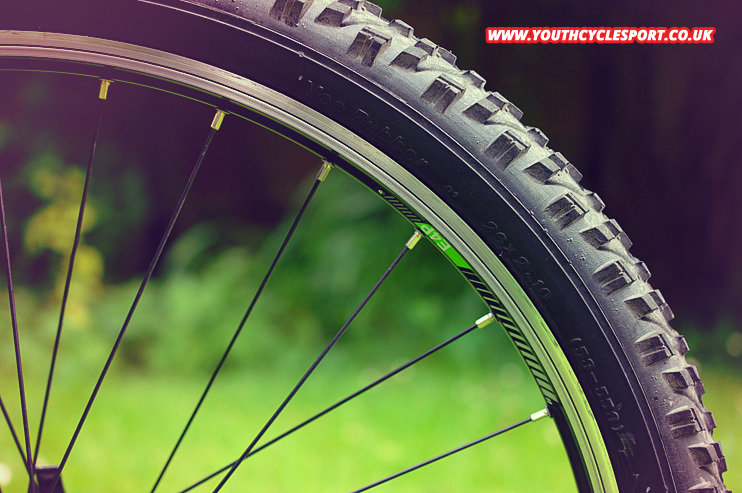 A child is unlikely to ever need the bike’s 42 tooth outer chainring off-road. Our favourite configuration for children’s MTBs is the modern approach of a single chainring combined with a very wide-ratio cassette. 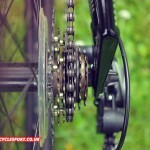 That gives sufficient low and high gears without the weight penalty and complexity of multiple chainrings. 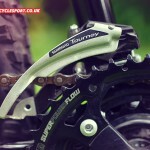 We were pleased that Boardman has specified SR SunTour 160mm cranks. 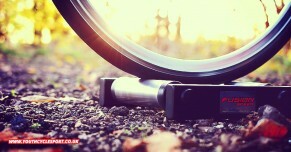 They are connected to the frame with a FSA square-taper bottom bracket. 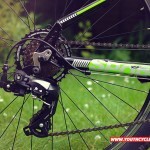 Like the Boardman hybrid there are front and rear Shimano Tourney derailleurs. 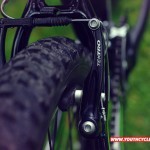 However the MTB’s rear mechanism has a long arm to give the extra capacity needed for its wider range of gears. They’re simple units but we’ve become fond of Tourney derailleurs which are reliable and change gear accurately. 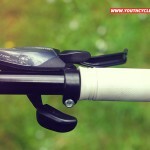 Shimano Altus trigger shifters handle the gear changing. 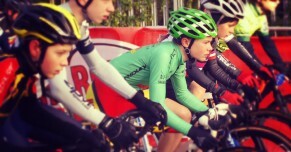 We already know them as positive units with the advantage of a clear gear indicator that children like. 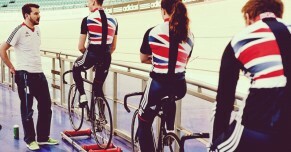 They change gear easily too. 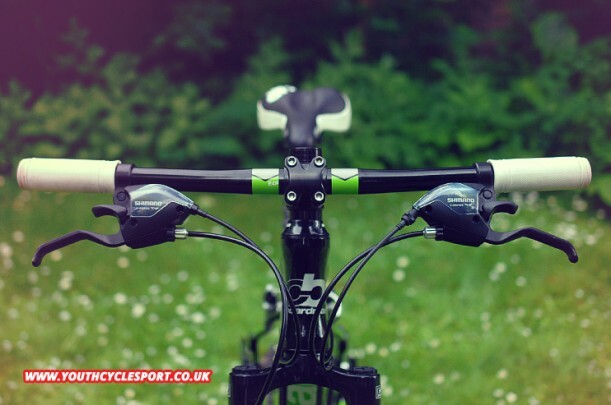 Just as with the Boardman junior hybrid, our testers sometimes had the irritation of their knees hitting the Altus pods & triggers when climbing out of the saddle. 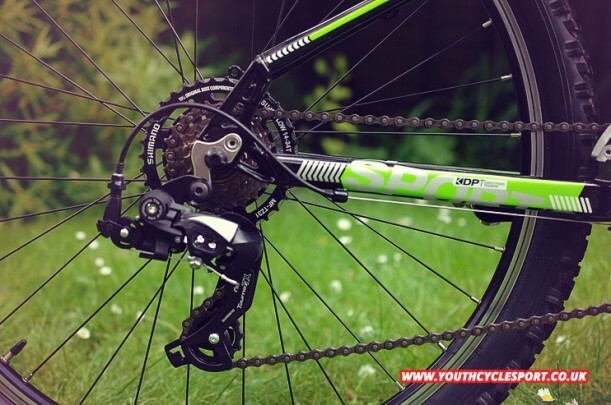 Boardman has wisely resisted fitting cheap, cable-operated disc brakes which are usually heavy and difficult to keep adjusted correctly. 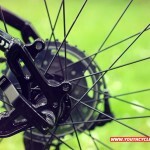 Instead, the SPORT/e MTB uses quality Tektro V-Brakes which are powerful and progressive. As rim brakes they lose out a little in wet or muddy conditions, but we’d much rather have them than cheap discs. 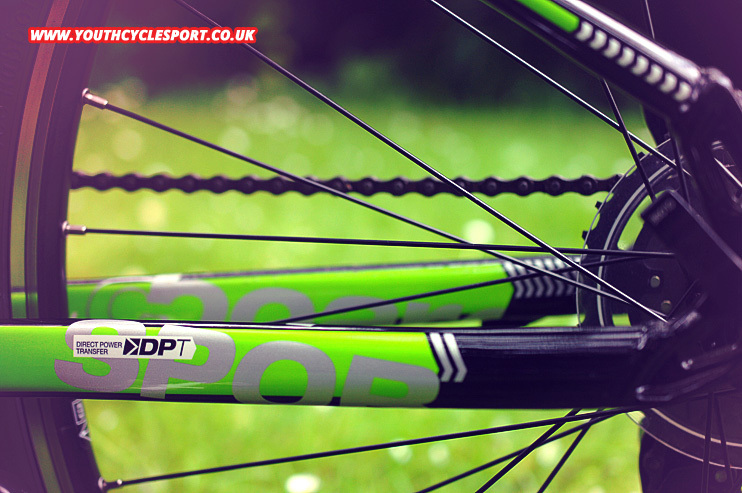 One of the things that makes the SPORT/e MTB look so smart and well-integrated is the styling of its Boardman E4P components. The short handlebar stem, zero-rise 540mm handlebars, and seatpin are shared with the other two Boardman junior models, and they are high quality for a bike of this price. Again, watch out for the very long layback of the seatpin, and be prepared to attach the junior saddle quite far forward on its rails to get a correct riding position. 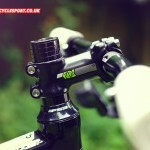 The FSA semi-integrated headset sits well inside the bike’s flared head tube. 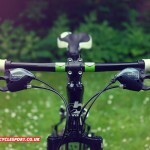 The MTB uses the same handgrips, gear shifters and brake levers as the hybrid, and they are positioned in the same way. Our testers found the bike more comfortable and easier to control after we moved the shifters and levers several cm further towards the handlebar stem. 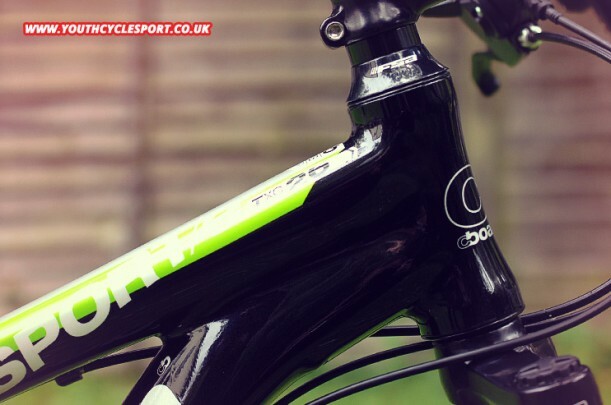 Boardman’s experience in designing adult MTBs that ride and handle well has completely carried through to the new SPORT/e MTB. It was sure-footed on fast bends, climbed well, and could be descended fast with confidence. Then, when just cruising along fire-roads, the bike was relaxed and comfortable. 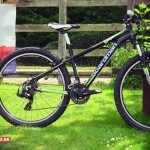 There’s no doubt that the bike is a proper MTB and can be used in all sorts of challenging terrain and weather conditions. 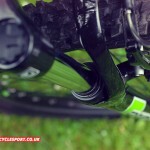 Don’t expect too much from the suspension, though, on rocky or rooty tracks. 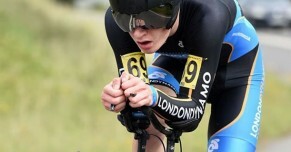 Fitting better tyres and choosing a good tyre pressure goes some way to compensating for that though. 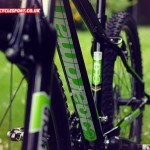 See our comments about service & support from Boardman & Halfords in our review of the SPORT/e MTB’s road bike brother. 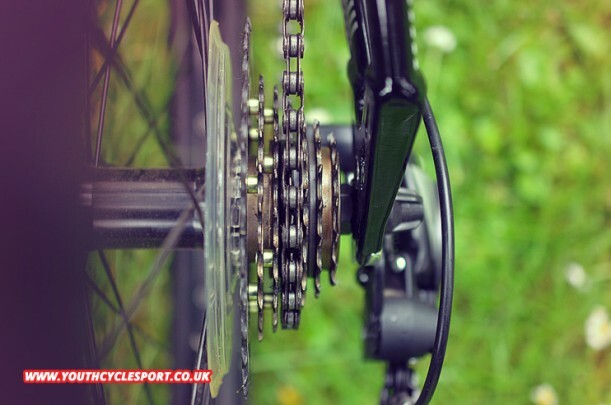 Once again, although the bike’s price is £300, a British Cycling member who takes advantage of their 10% membership discount and one of the frequent Halfords special offers might pay as little as £250. 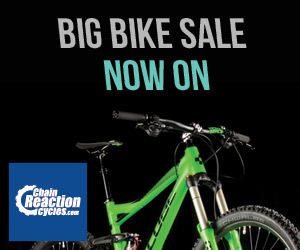 Just like the Boardman junior hybrid, that’s a bargain. 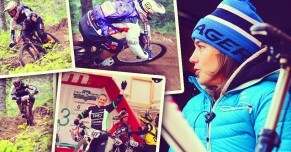 We can’t see too many serious competitors with that value for money. 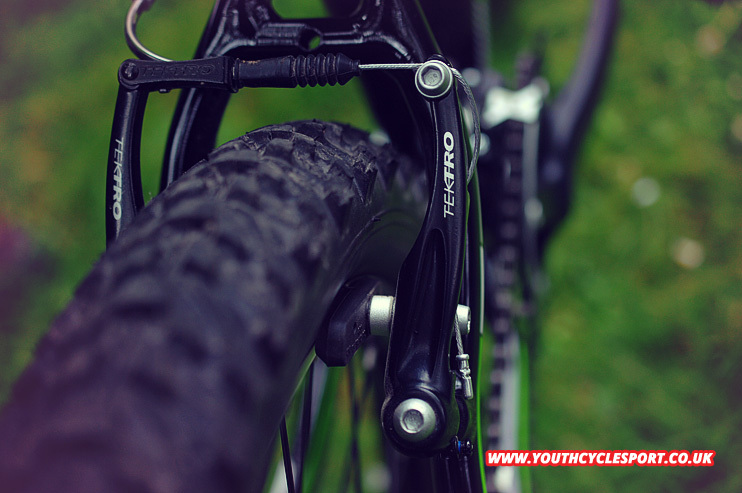 And you could use the money you’ve saved on a few good upgrades like tyres and handgrips. 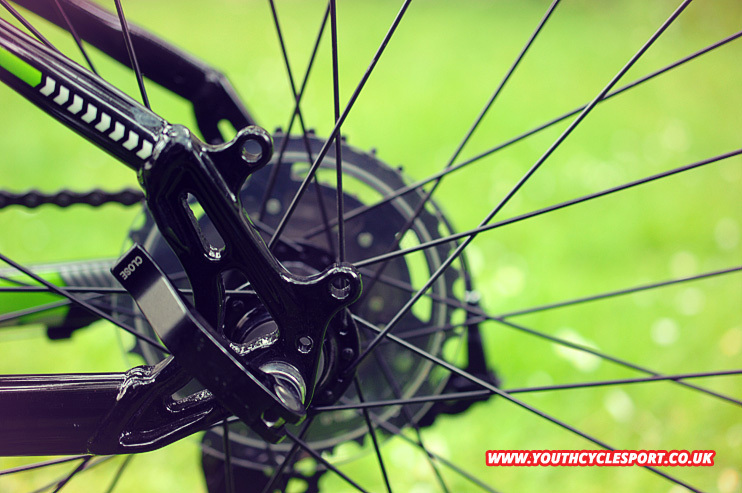 A MTB’s condition will soon deteriorate with a lot of off-road use, so protect the value of the bike by keeping it clean and well-lubricated. A rebuild every six months, replacing cables, chain, and even bearings will pay dividends and make the bike easier to sell when the child outgrows it. 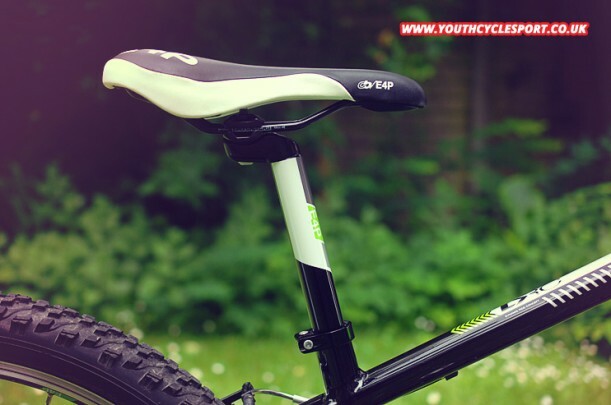 We came to think of the SPORT/e MTB as a kind of mini-29er cross-country bike for children, with its short stem and relatively upright position. 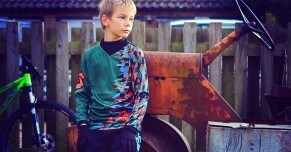 And it does inspire the same kind of riding confidence that adults often find when riding 29ers. It’s not a light bike, but you must remind yourself that this is a proper MTB for children that costs £250/£300, not a £700+ machine. 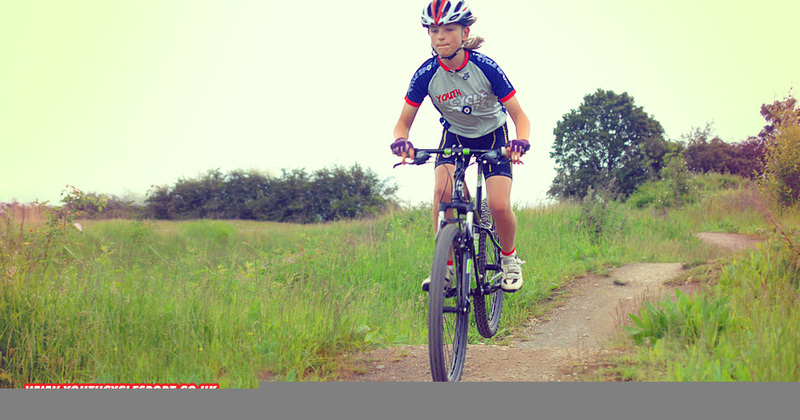 If your child is keen to ride off-road at trail centres or on bridleways they’ll find the SPORT/e MTB more than up to the job. 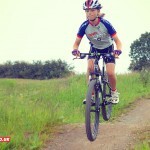 The bike is a great starter-MTB for kids.